Woodley is a town in Berkshire and also a suburb of Reading. Its name means 'a clearing in the wood' and it is thought that the wood in question was Windsor Forest / Windsor Great Park. Pre Second World War, Woodley was a village, but during the 1930's Woodley Aerodrome was opened, firstly as a flying school and shortly after, the manufacture of the Miles Hawk 2-seat light monoplane began. The expansion of Woodley continued in the post-war years as industry moved into the area from Reading and new housing developments were built. The aerodrome closed in the 1960's and since then the town has essentially become an extension of Reading. In 1964 Woodford Park was opened and this is the park that is home to Woodley parkrun. Arriving in Woodley on New Year's Day 2017 after just running at Maidenhead parkrun, I had a couple of parking options available. 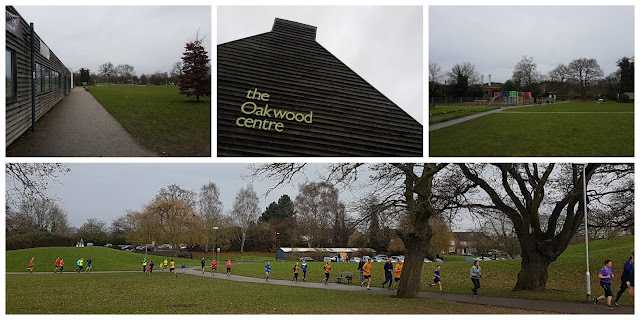 The advice on the Woodley parkrun website is to use the pay and display car park opposite the entrance to the park, however, I had spent some time looking on Google maps and had found a side street, a few hundred metres away, to park on and I ran the rest of the way to Woodford Park. Had I taken the train, I would have headed for Earley station which is approximately 2 kilometres away from the park. For anyone taking their bicycle to the venue, I spotted some bicycle racks just outside the Brown Bag Cafe at the Oakwood Centre, which is quite convenient as this is where the team head to for the post-run refreshments. As for toilets, it looks like the original park facilities were demolished a few years ago. From what I can see on the Woodley Town Council website, the Oakwood Centre is now the place to head to for toilet facilities. Once at the Headley Road entrance to the park, I immediately spotted a cluster of hi-vis vests and continued to jog over towards them. The event had its inaugural event back in October 2012 and you can tell that there is a very well oiled team on hand here. The meeting point is at the skate park and as I was a little early, I had a little look around the park. The park is essentially divided into two sections - the southern part is your typical town park with a playground, skate park, cafe, and war memorial. The northern side is mostly sports orientated and in between the two halves there is a lake, which was added to the park in the early 1970's. I headed back over to the meeting area and was just in time for the first-timers briefing. After this, the main briefing took place at the skate park and the runners where then ushered over to the start line, which is on the grass just outside the Oakwood Centre. The course is run over three laps (not completely identical) and underfoot there is a combination of grass and tarmac. It is essentially flat, but the northern half is at a slightly higher elevation than the south side so there is a slight incline/decline to run each time you switch between the two. The course is narrow in places however it is perfectly runnable with a buggy. Also, the team ask that runners do not run with head/ear-phones on/in. However, those that still wish to listen to music can do, provided they keep one ear free to listen out for instructions from the marshals around the course - please read the text in the course description on the course page for more information. The first lap is slightly different to the second and third. From the start, the runners head diagonally across the open grass field at the front of the park before picking up the tarmac path and following it around, past the lake and up a short, sharp incline which brings them out in the northern half of the park which is made up of a selection of sports pitches. Soon the surface underfoot changes to a grassy/dirt path and this is followed right around the perimeter of the football pitches until it rejoins the tarmac path which brings the runners out back at the lake. Following the path around lake, the runners soon arrive back in the southern section and head along the tarmac path down to the southern border adjacent to Headley Road. The runners face a little chicane around the war memorial and then reach the corner where the run started. For laps two and three they continue to follow the tarmac path which leads back down to the lake - here the runners continue to follow the same route as before. At the end of lap three, at the war memorial, instead of continuing on the tarmac path, the runners are directed onto the grass where there is a final dash straight over to the finish funnel. I had my barcode scanned right next to the finish line and briefly headed off for a cool down. Returning a few minutes later, I bumped into the Woodley parkrun's original Event Director and parkrun South East Region ambassador, Kerri and a few other parkrun tourists including Adrian and Chris. After a little time spent chatting, I was starting to feel the cold. So I headed off to the car to get changed and start the hour-and-a-half journey back to Kent. The official results had been processed by the time I arrived home and I saw that 315 people had taken part in the run. This was a little higher than the average turnout, but not by a huge amount. 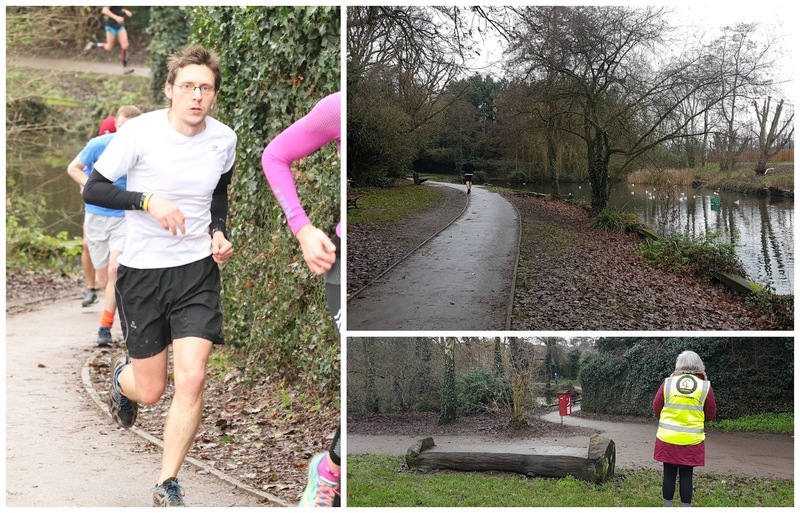 As always I had recorded my run using the Strava app on my phone and you can see the exact route, elevation etc via this link: Woodley parkrun event 226. I'd had a fab New Year's Day morning out in Berkshire visiting two lovely venues - a huge thanks, as always, goes to the volunteers that were out making this all possible!